When the American Bank Note Co. took over Continental in 1879, some of the Continental plates were used before new plates with American imprints were made. The American printings from Continental plates can be distinguished by the soft porous paper and shade. 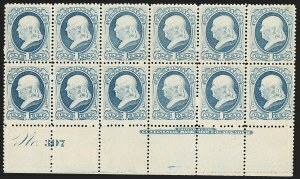 The plate block offered here is printed on an intermediate soft paper attributed to American. This plate block is listed in the Chapin census as Scott 156 on "intermediate paper, late printing." To reflect current classification criteria, we have decided to offer it as an early American printing on intermediate soft paper, Scott 182. There are eight plate blocks of Scott 183 recorded in the Chapin census. Among these there are only three recorded top plate blocks, including one in a pane of 100 which may or may not be intact. The Wampler collection contained a bottom plate block from Plate 391, which was not included in the Chapin census, bringing the total count to nine plate blocks with three known from the top position. 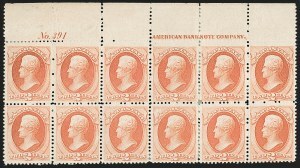 The other top position plate block outside of the pane has the Continental Bank Note Co. imprint, so if the pane is intact, then the example offered here is the only top position plate block with the American imprint. When the American Bank Note Co. took over Continental in 1879, some of the Continental plates were used before new plates with American imprints were made. The American printings from Continental plates can be distinguished by the soft porous paper and shade. This is one of six top plate blocks of Scott 184 listed in the Chapin census with the old Continental imprint. 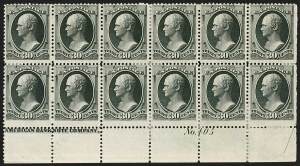 Only two plate blocks of Scott 185 are known. The only recorded top position plate block is offered here. 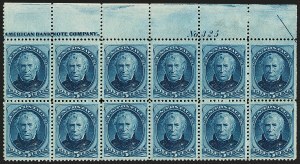 The other plate block, a bottom position from Plate 325, was offered in the 1998 Wampler sale held by Shreves Philatelic Galleries. When the American Bank Note Co. took over Continental in 1879, some of the Continental plates were used before new plates with American imprints were made. The American printings from Continental plates can be distinguished by the soft porous paper and shade. In the case of the 15¢, new plates were never made, so they all show the Continental imprint. The distinguishing factors are color and paper. 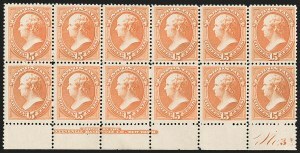 No Scott 190 plate blocks are known with the Continental imprint--the known examples come from Plate 405 (American imprint). The Chapin census lists four plate blocks plus a pane of 100 offered in the 11/13/1944 Green sale, which was not illustrated. If that pane was broken, it is possible its two plate blocks are included in the census. We have not offered one since the 1992 Rarities of the World sale. The same plate was used for all 90¢ Bank Note stamps starting in 1870, and the imprint was never changed to reflect Continental or American Bank Note Co. printings. The Chapin census lists the strip offered here, plus a top imprint and plate number strip of six of the perforated stamp in the Rose sub-shade (ex Caspary). A third has since come to light, a bottom imprint and plate number strip of five, which was offered in our 2012 sale of the Frelinghuysen collection. However, this remains the only imperforate imprint and plate number strip extant.